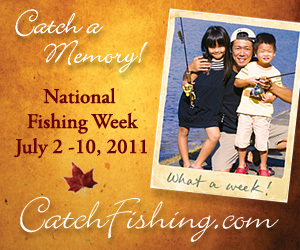 Have you made plans for National Fishing Week yet? It?scoming up fast, kicking off this Saturday, July 2, and running through toSunday, July 10. Even if you don?t participate in an official event, it?s agreat time to take a kid fishing or introduce someone new to the sport. Thatis, after all, the main point of National Fishing Week: to get more Canadiansoutdoors and enjoying the great sport of fishing. Along with licence-free fishing days, hundreds ofangling-related events are planned in more than 100 communities across thecountry. Tournaments, derbies, sales, lessons?you name it?will be taking placethroughout the week. Click here to find an event near you. National Fishing Week is a joint project of the Canadian NationalSportfishing Foundation and the National Recreational Fishing Task Grouprepresenting the provinces and territories. Tackle retailers and outdoororganizations are also involved. The week-long festivities are a part of the much broader,ongoing ?Catch Fishing? campaign designed to promote angling in Canada. As theCatch Fishing website points out, fishing is not only a fun, healthy pursuit,it?s also good for the economy: angling and related activities generate some $7billion annually. Wet a line and help the economy?works for me!